"This thing has been frozen in ice for 20 million years. So I figure it must be lonely." John Landis is one of the modern greats of comedy, having made such films as The Kentucky Fried Movie, Animal House and The Blues Brothers. Rick Baker is one of the most acclaimed makeup artists today, having won fully one-third of the Oscars® in the makeup category since it began in 1981. Something not everyone knows is that they essentially got their start in the same place, in the do-it-yourself horror-comedy Schlock. This parody of Joan Crawford's Trog also satirizes many films and much of modern life (especially television). In a small California town, 769 people are dead, victims of a "Banana Killer" who leaves peels at the scenes of his crimes. Unknown to the police, headed by Det. Sgt. Wino (Saul Kahan), the killer is in fact the Missing Link, genus Schlockthropus (director Landis, in makeup by Baker). How he managed all this carnage is questionable, since our view of him is pretty benign. He does, however, get enraged every now and then, especially when someone comes between him and his love, blind Mindy Binerman (Eliza Garrett), who thinks that he's a dog. Schlock continues his rampage through a high school dance, an ice cream parlor and a movie theater, among other venues, until a rooftop small-scale King Kong-homage climax. 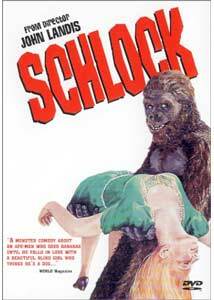 Originally intended to be the filmed with a bad gorilla suit, Schlock took a historic turn when Landis was referred to Baker. His Schlockthropus suit is highly effective and looks quite real; Landis makes the most of it with behavior that is alternately apelike and humanesque. The lifelike quality makes more credible the persistent rumors that Baker or Planet of the Apes makeup wizard John Chambers (who plays a National Guard captain here) was responsible for the ape suit in the infamous home movie that purports to be of Bigfoot. Baker and Chambers aren't talking. The comedy is broad and heavily Jewish in flavor, reflecting Landis' own upbringing (he was only 21 at the time). There is a fair amount of slapstick, but the best parts are the film satires. Especially notable is a 2001 satire of the "ape with the jawbone" scene. Others are less likely to elicit a laugh today: who remembers Elvira Madigan or Euell Gibbons any more? But for those who do, these are effective gags. There is some tasteless and funny humor at the expense of the blind Mindy, as well as numerous non sequiturs. Why, for instance, is Mrs. Binerman (cult favorite Harriet White Medin, under the pseudonym Enrica Blankey) keeping plastic walnuts in the microwave? Why does the doctor who removes Mindy's bandages walk into the closet? Probably funniest is the running gag of the fictitious movie, See You Next Wednesday, which metamorphoses from love story to war drama to dinosaur movie (actually distributor Jack H. Harris' Dinosaurus). During the theater sequence, The Blob (another Harris production), intercut with See You Next Wednesday, is playing, including the bit where the cast is watching Daughter of Horror (yet another Harris vehicle). We thus get the highly weird sensation of watching a movie of people watching a movie featuring people watching a movie....my head hurts. Novice director Landis does a surprisingly competent job here for a 21-year-old with no prior experience. He acknowledges that he didn't have proper coverage for many of the scenes, but he obscures this fact artfully with good editing, so that one doesn't really even notice the lack of different perspectives on certain scenes. The theater sequence feels like padding, but we learn from the commentary that it is in fact padding, shot eight months later at Harris' behest to fill out feature time. Famous Monsters of Filmland editor Forrest J. Ackerman has a bit part in this sequence that is pretty amusing. The pacing in general works well, and other than some bits being dated the humor stands up well. Image Transfer Review: Anchor Bay's anamorphic widescreen transfer is just gorgeous. It's impossible to believe that this film was shot in 14 days for $61,000. It looks terrific, with no damage visible whatsoever. Colors are like new, blacks are solid and shadow detail is good. The picture is crisp and detailed throughout. I was expecting much worse than this fabulous presentation. Considering this is a single layer disc, I have to acknowledge Crest National as the new champions of DVD compression. No artifacts are visible at all. Audio Transfer Review: The 2.0 mono is clean and noise-free. Dialogue is clear throughout. Music sounds slightly tinny and cheesy, but that is no doubt a relic of the low-budget origins of the film. Really nothing to complain about here. Extras Review: The foremost extra is a commentary from Landis and Baker. They're in excellent form here and their amusement is infectious (though the viewer should be warned the language gets R-rated at times). They have loads of stories to tell, and there are dead spots only rarely. Predictably, much of the time is devoted to the Schlock suit itself, and the details of its creation are interesting for those with a technical bent, and the general conversation is amusing enough to keep the interest of those not so technically minded. In addition to a trailer, there are four radio spots of varying length, a still gallery featuring about 20 stills, plus posters and pages from the pressbook. Finally, there are lengthy bios and selected filmographies for both Landis and Baker. This is a terrific package for what is admittedly a very minor film. John Landis hits the ground running with his horror/comedy tribute to guys in monkey suits. Plenty of worthwhile extras and a flawless transfer make this one a must-buy.